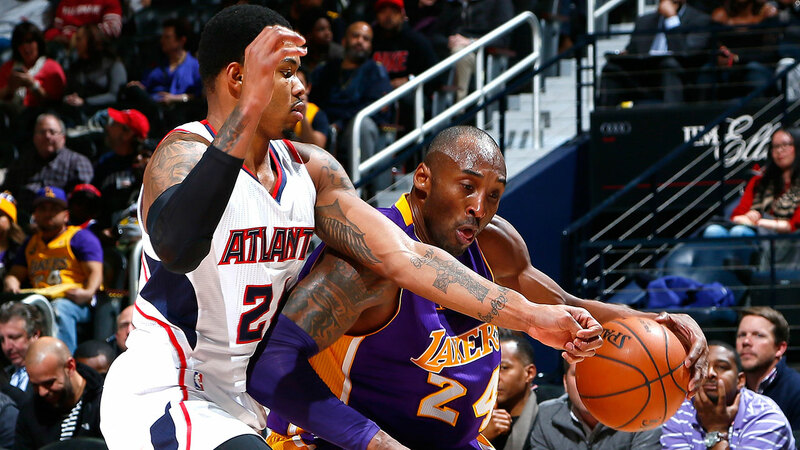 Since January, Kent Bazemore, the dude widely acknowledged as the happiest on the Hawks bench, which is not a somber place, has been averaging almost 22 minutes per game, filling highlight reels with dunks, blocks, steals, and smiles. On March 6, in the Hawks’ statement win over the Cavaliers, Bazemore helped clamp down on LeBron James in the second half and finished with a game-best plus/minus. Not bad for a guy who, by his own admission, was on the cusp of falling out of the league not long ago. Yesterday, during the team’s final West Coast swing, he opened up about playing with Kobe, playing for Danny Ferry, and his fondness for old-school pranks. Do you ever look around and wonder, How’d I get here? How’d we get here? It’s kind of ironic: When the Hawks were in the playoffs last year, I was rooting for them.1 They’ve got the underdog mentality. No big names out there, people didn’t talk about them, but they get the job done, and I’ve always been a big fan of blue-collar teams. In high school and then college at Old Dominion, we never had any “player of the year” guys. No McDonald’s All Americans. You just showed up, played hard, and played together. That’s what we do here. Yeah. It keeps the blood boiling a little bit. I think Dennis Schroder was the one who started it here. He’s in charge of keeping the cards, since he’s the youngest right now. There’s six guys playing sometimes, and those games get really intense, man. Al Horford is winning right now. Jeff Teague is pretty solid. Dennis is really good. He’s sneaky: He blends the 9s with the 6s sometimes. He gets away with murder. He’ll play real fast; it’s such a quick game, a guy can play out of turn if you’re not looking. Kyle Korver and I are struggling right now. When you win at Uno, do you do your NBA 2K14 celebration? [Laughs.] I talk trash when I win. When I first started with the team … they had already started playing. But I made a run and I let them have it. It was kind of reminiscent of my whole career so far, actually. How does an elite-level bench celebration work? It’s a reaction thing. You can’t really be proactive. Doing that will get you in trouble sometimes, like when you stand up when your teammate gets the ball and then he shoots an airball or he shoots at the side of the backboard. I’ve seen enough shots from my teammates to know when a shot looks good. When you’ve got guys like Kyle Korver shooting, you can stand up before he even looks like he’s gonna shoot, and it’s gonna go in five out of 10 times. Guys on the team say you’re the funniest. Funny how? I’m just a happy person. When I’m around, a lot of people will laugh. That’s what I pride myself in. I’m very sarcastic. And, you know, I crack jokes. I do it all. Growing up, I was a huge prankster. I haven’t done that at this level with the cerebral guys around here. You may start a war if you get somebody that type of way. I remember, in elementary school, the whole whoopee cushion thing. That was the rage for a long time. People downplay the whoopee cushion, but people thought it was funny when you sat on it, and they blame you for passing gas. The whole water fountain thing too. Somebody comes by and you push their head in there, water gets up the nose. I mean, you’re coughing for 10 minutes. The list goes on: pouring salt in your cereal for breakfast. We did a lot of that growing up. You came onto the radar for a lot of people as a super-athletic defender and a great dunker. Is dunking still your signature? I’ve kind of catered my game to longevity. All that jumping and landing really wears on you. Even now, I’m really conscious of trying not to hit the floor, trying to land on two feet under control. Those things that really add to your career. If you look at guys like Dwyane Wade, he had the whole slogan: Fall seven times, stand up eight. But it wears on you. You’re going 110 miles per hour, jumping eight feet in the air, and landing on one part of your body. It’s not good over time. And there’s no way I’m outjumping Zach LaVine anyway, so I’ll just not waste my time with that. I figured out my sophomore/junior year of college: All the athleticism in the world will only get you so far. It’s more important to learn the intricacies of the game. What’s been the biggest step for you this year? Definitely perimeter shooting. That was a gaping hole in my game my first two years and one of the reasons I was on the borderline of not getting another contract. But when I got to Atlanta, the first thing Coach Bud told me is, “We’re getting you a shooting coach and we’re changing your jump shot.” Being sidelined with an injury, I didn’t really get a lot of shots this summer. Not being in the gym and shooting with those old bad habits made it easier to adopt this new form. Now I’ve got that corner 3 going. What player did you most admire growing up? Kobe Bryant, for sure. And it wasn’t because he was scoring and the moves he did. It was the fire he plays with. I used to sit in front of the TV and you could feel, when the game got close, that he decided to take over. You could feel the fire. His facial expression, the way he attacked the rim, willed his team to victory. You could feel that type of stuff coming from him. And it’s contagious. I was up at 1 a.m., you know, pumped up and sweating, and I had to go to school the next day. I was too young to understand what Jordan did for the game. Kobe was my guy. Is it hard to play with him, though? No. That’s one of the things I learned. People who have already done what you’re trying to do are the first people you should try to listen to. And he knows what it takes to be a champion. So if he tells you something difficult to hear, he’s trying to get the best out of you. That documentary he did, it really opened a lot of eyes to who he actually is. He waited this late to start talking, which is kind of crazy — the end of his career to start telling his secrets. But I think it really did him some justice to come clean about why he did certain things. Five championships later, you really can’t question it. I imagine the Hawks’ locker room is a little less intense, though, than the Lakers’ is with Kobe around. It’s been relaxed for the most part. Everyone has done a great job of not getting complacent, though. We’re all focused right now on taking that next step as a group. We understand what we’ve accomplished so far this year, but it doesn’t really matter, unless you do what you’re supposed to do and handle your business in June. At the beginning of the season, would you have believed your first team, the long-lowly Warriors, and your current team, the long-middling Hawks, would be tops in the league? I mean, no. But I would say this: When you’re all in there in the weight room in the morning, then you go on the floor, then you get to hang out after practice, you start to see the mind-set building and you see “We’re gonna be pretty good.” You might laugh at the time, but in the grand scheme, everybody feels like they have a chance. To be at this level right now, though, it’s a bit of a shocker. We’re looking forward to playing the Warriors. The two best teams in the NBA. The last time was an all-out battle, probably one of the most intense games I’ve played all year — and we’ve had some barn burners. I still have a soft spot for this Warriors team. They gave me an opportunity to chase this dream, because I wasn’t drafted. I’m always rooting for them, unless I’m playing against them. As long as there are chairs on the sideline, then I’ve got a good shot. [Laughs.] I’ve always said if I get into something: You never use your hands, man. Your hands is your moneymaker. So I’ll end up grabbing something. Does Danny Ferry’s name come up in the locker room much? Yeah, you know, he’s definitely a huge part of this year’s success. It was unfortunate what happened, but that doesn’t change the way I feel about Mr. Ferry. I flew into Atlanta this summer and had lunch with him. And he’s a great guy. We sat there, we laughed, we joked. He has a huge group of friends, believe it or not, in the NBA. So I look at it as a business. He’s trying to do his best for his organization, and he’s done a great job of getting the right guys in and creating a team that’s number one in the East and almost the best team in the NBA right now, recordwise. He could win the GM award. That tenure down in San Antonio, he was around a lot of great guys. But he was able to go to an entirely different organization and kind of plant the same roots. I’m definitely honored to be a part of that tree. I can actually say that I played under one of the best coaching trees and organizations in basketball. Bazemore played for the Lakers and Golden State last season.